Recipes for Dinner the Quick and Easy Way! 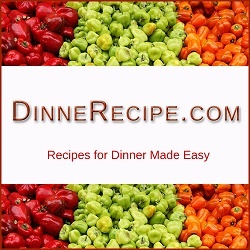 Recipes for Dinner is a great meal planning alternative to the "Plane Jane" recipe websites. I love to cook and create fantastic dinners from scratch based on the things I find in my kitchen. The ideas come to me as I scan the ingredients in the fridge, freezer, pantry, and cupboards, but I often think, "Is there a better way to come up with cooking recipes that will appeal to the whole family?" I've search Google for recipes, which is great for a one course meal. Then I have to think up and search for other recipes that I can make along with it. Then it occurred to me that you may be having the same problem I am. This website is about making the dinner planning task as simple as possible, whether you are the husband, wife, or teenager trying to cook up a quick meal for the family after a long hard day on the go. You don't have to be a seasoned chef to create the best home cooked meal your family has ever had; you just have to put it all together with health, simplicity, and taste involved. Use this site to put recipes for dinner together based on things you already have in the house. Most people don't have time to plan and shop for two weeks worth of dinner, yet they still go out shopping for one or two week's worth of groceries that may or may not go bad before they are used. Two Weeks of Groceries for Two Weeks of Dinners! I grew up on a two week dinner schedule that NEVER changed. My mom, bless her heart, would do the whole two week plan and go shopping for that two weeks. Every day she would make the main course, a vegetable side, a starch, and a dessert if we were lucky. The only problem was that the menu never changed. We knew exactly what we were going to eat based on the day of the week. How many different ways can you cook a potato? Based on my mom's two week schedule, I counted seven. After seventeen years of the same potatoes, I spent the next several years avoiding them altogether. Simple Recipes for Dinner the Whole Family Will Enjoy! The two week dinner planning schedule no longer exists in this day and age. Everyone is too busy doing this, that and the other thing. They intend on shopping for certain meals, but it doesn't take much to throw a wrench in the plan. I never had any formal cooking instruction. I learned the easy way - by trying. I self-taught myself everything I needed to know, such as temperatures, spices, cutting techniques, and nutrition when I needed to learn it. I've burnt a few things in my time, but I've also made some "best I every had" meals that are difficult to top. My vision for the Recipes for Dinner website is to help you plan out the random dinner that the whole family will enjoy. You can shop for two weeks, then check out my site for ideas to put what foods you enjoy together into the perfect dinner. Or you can check my site out first and grocery shop based on the recipes you find. My cooking recipes are divided into courses, cooking methods, and food types so it is easy to mix and mingle the different dinner ideas together for your family. Subscribe to DinneRecipe of the Week Newsletter! To keep you up to date on new recipes added to my site, you can subscribe to my weekly newsletter where you will receive the top recipe for the week and all of the other dinner recipes added during that period. Subscribing to DinneRecipe of the Week Newsletter is easy! Simply complete the form below and click Subscribe. You will immediately receive an email to verify you want me to send my newsletter to you. You must verify that email or you will not receive emails from Recipes for Dinner. If at any time after you subscribe you don't want to receive my recipes any more, simply click any of the unsubscribe links at the bottom of those emails. Contact me if you have any questions about this process. I hope your quest for quick and easy recipes for dinner will be satisfied through the information you find throughout my site. Be sure to subscribe to my newsletter to stay up to date with my latest dinner recipes. Please like my Easy Recipes for Dinner Facebook page and become a Fan to follow along with some easy recipe ideas you can try for dinner. You can also follow me on twitter. Let everyone know what you think! Leave a comment in the box below. © 2015 Copyright by Jason Moser. All rights reserved.